Eye injuries in sport are caused either by trauma or a foreign body in the eye, or infection. As with any head injury, it is advisable to seek medical advice with any injury to the eyes, especially if vision is impaired. 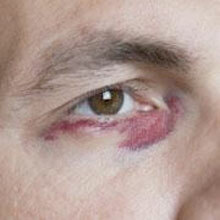 A black eye is a bruising of the soft tissues surrounding the eye. Also known as an eye contusion. It usually happens following an impact or trauma to the eye. Symptoms of a black eye are often difficult not to notice! Bruising and swelling occur around the eye which will be painful and tender. It may not be possible to fully open the eye and vision could be impaired. Black eyes are common in contact sports such as rugby, and especially boxing. They are caused by a direct impact of a blunt object, to the eye area. The skin around the eye is very thin and so it doesn’t take much to damage the underlying blood vessels, resulting in bleeding and subsequent bruising. Other, non-sporting causes may include falls where the head hits the ground face first or falls onto an object such as an item of furniture and fights or punches directly to the face. Apply ice to the area as soon as possible for 10 minutes every hour for the first 24 to 48 hours if necessary. The can be reduced over time as swelling reduces to 2 or 3 times a day if needed. Resting with the head up will reduce bleeding in the area. Painkillers or anti-inflammatory medications may be prescribed. If the injury is particularly severe you may need to seek medical advice to rule out any facial fractures. Usually, a black eye will heal on its own within a week or two. A detached retina occurs when the lining at the back of the eye starts to pull away from the blood vessels at the back of the eye. This can lead to blindness so should be treated quickly. Symptoms include the appearance of floaters within the vision. These are dark spots which appear to drift or float in front of the eye. Vision may be blurred and the patient may see flashes of light in the eye or a shadow across their field of vision. A detached retina is most often caused by a direct trauma to the eye from a blunt object. It is a common injury in boxers. Age can also increase the likelihood of a detached retina because the retina becomes weaker and thinner with age. Tiny holes develop inside the retina which allows fluid (which is normally found between the retina and lens) to seep through. A build-up of fluid can cause the retina to start pulling away from the back of the eye where its blood supply is. With a reduced blood supply, the cells of the retina will begin to die. If a detached retina is suspected the patient is referred to an eye specialist. They will observe the eye using an Ophthalmoscope to view the retina at the back of the eye. An ultrasound scan may also be used to see the back of the eye. Surgery is required to reattach the retina. This is usually completely successful and may only require an overnight hospital stay. A corneal laceration is a tear or cut of the cornea – the front lining of the eyeball. It is usually caused by something sharp flying into the eye or an impact from something sharp. Symptoms include pain in the eye with the feeling that there may be something stuck in the eye. The patient may have affected vision with increased sensitivity to light. The pupil may appear tear shaped rather than round and there may be bleeding in the eye. The most common causes of corneal lacerations are activities which may cause something to fly up and enter the eye. These include chopping wood, strimming grass, and carving stone. A corneal laceration is deeper than a corneal abrasion which simply scratches the cornea rather than cutting through it. If you suspect a corneal laceration, seek medical attention immediately. An ophthalmologist or doctor who specialises in eyes will examine the eye. They may use numbing drops to make this more comfortable for you and to encourage you to keep the eye open. An eye stain may also be used to help detect the amount of damage. Surgery is usually required to repair corneal lacerations. Any fragments remaining in the eye will also need to be removed. The eye will be patched following surgery to protect it. A cornea abrasion is a scratch on the cornea of the eye from an external object. This might be a finger, a twig or small pieces of paper or gravel blown up in the wind. Symptoms include pain in the eye with a gritty feeling when blinking. The patient may have the feeling of something stuck in the eye. Watering eyes, visual disturbances and a dislike of bright light are also symptoms of a cornea abrasion. The most common cause of a corneal abrasion is getting a foreign object in the eye which scratches the surface. Examples include being poked in the eye or pieces of leaf or twig which have been blown up in the wind. Other causes include contact lens use. Contact lenses which are poorly fitted, overworn or unclean may also cause damage to the cornea. Corneal abrasions tend to heal on their own in time. Anti-biotics may be given to avoid infection. Your doctor may also prescribe painkillers. If in doubt visit a doctor or optician. A sty which is sometimes called a hordeolum on the eye occurs when a gland on the eyelid becomes infected. This can occur on the inside or outside of the eyelid and looks like a spot or a pimple. Symptoms include tenderness on the eyelid with redness and swelling. A small head may appear on the swelling like a spot or a pimple. Sty’s usually appear at the base of the eyelashes. There may be some minor visual impairment. Sty’s on the inside of the eyelid feel like there is something stuck in the eye. A sty is an infection of an oil gland caused by staphylococcal bacteria. The infection usually occurs from rubbing the nose and then the eye. The bacteria involved are most often found inside the nose. In most cases, a sty will heal on its own within a week. Don’t ever try to squeeze a sty. They may just disappear on their own, or they may rupture and then clear. Stys on the inside of the eyelid may not heal or may be irritating in which cases an ophthalmologist (eye specialist) may drain the sty for you. Conjunctivitis or pink eye is an inflammation of the membrane covering the white of the eyes and the underside of the eyelids. There are numerous causes of the condition which is relatively common although not usually serious. The eye will have a bloodshot appearance. It may irritate or feel like a burning pain in the eye. The eyelids may be swollen and the patient could feel as if they have grit in the eye. Vision is likely to be impaired and a sticky discharge from the eye with crusting around the eyelashes may be present. Conjunctivitis usually occurs in both eyes together, although not always and may start in one and spread to the other. Bacterial Conjunctivitis can be treated with antibiotic drops. The eye should be cleaned regularly with cotton wool soaked in cooled boiled water to remove any discharge. Allergic Conjunctivitis will require antihistamine drops. The cause of the allergic reaction should be identified in order to reduce exposure and change of contracting conjunctivitis. Viral Conjunctivitis currently has no cure. Relief may be obtained by using eye drops or lubricants. Using a cold compress may help ease itching, irritation, and swelling. Paracetamol or ibuprofen medication may be prescribed to help ease discomfort and swelling. Reactive Conjunctivitis required identifying and avoiding the trigger. In the meantime, eye drops and cold compresses may ease discomfort. There are a few simple rules which can help you to avoid contracting conjunctivitis. The viral and bacterial forms are contagious and so you should also be careful not to pass it on to anyone else. Wash the face and hands regularly to kill bacteria. Don’t share eye makeup or eye drops. A foreign body in the eye is a small object which enters and gets stuck in the eye. This may be something which sticks to the front of the eye or gets trapped under the eyelids without actually entering the eye. Symptoms of a foreign body in the eye will include pain and a gritty feeling of something stuck in the eye. The eye will water considerably and vision is likely to be impaired. It is very common to get a small piece of grit, sand, dust or even an eyelash stuck in the eye. This happens when something is blown into the eye, for example on a windy day, or when something falls into the eye when we are looking upwards. 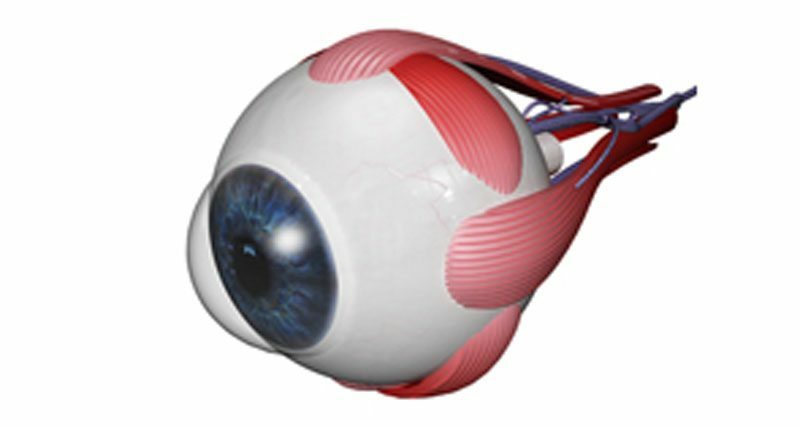 Objects which actually enter the eye are less common. They occur when people are hammering at something such as wood or metal and a small chip flies off and into the eye. In many cases, whilst this is a more serious injury it is not as painful. Rinse the eye with warm water to try to rinse out the object. Don’t stick anything (like a cotton bud etc) into the eye as this could cause further damage. If this doesn’t work or if you continue to get symptoms, consult a doctor. If you suspect that something entered your eye, seek medical attention as soon as possible. Hyphema is bleeding within the front chamber of the eye, between the iris and cornea. This is usually caused by a direct impact to the eye from a blunt object. Blood may be seen in the front of the eye. The patient will have partially, or sometimes fully, impaired vision with pain which increases as the pressure from bleeding increases. A hyphema is usually caused by an impact to the eye from a blunt object. Examples include punches to the eye, falls or being hit with a ball or other flying object. Seek medical attention asap. In most cases, the blood will be reabsorbed, however, to achieve this the following guidelines may be recommended by your Doctor. Rest with the head elevated and try to move as little as possible. Avoid medicines containing aspirin as this thins the blood and may increase bleeding. Your doctor may prescribe Atropine or steroid drops. Wear an eye patch to protect the eye. The doctor will regularly check the eye for progress. You will need regular check-ups for several weeks and annual check-ups for glaucoma.